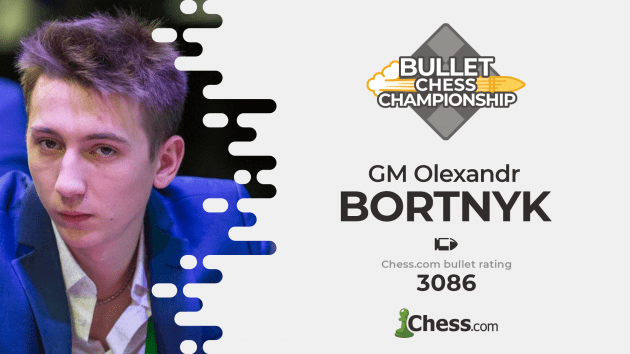 Olexandr Bortnyk turns out to be a great bullet player. | Photo: Maria Emelianova/Chess.com. He wasn't considered a favorite but GM Olexandr Bortnyk ended up winning the bullet round robin qualifier on Friday. The 22-year-old Ukrainian grandmaster won the $750 first prize and qualified for the main bracket of the Chess.com Bullet Championship, this weekend. Watch the quarter- and seminfinals of the Bullet Championship today, April 6 at 10 a.m. Pacific time (19:00 Central Europe) on Chess.com/TV or Twitch.tv/Chess. The round robin qualifier was a 10-player tournament in which each player played every other player twice as White and twice as Black. Up for grabs was a spot in the main bracket. The first three players to qualify for yesterday's round robin were GMs Andrew Tang, Jan-Krzysztof Duda and Georg Meier, who finished in second, third and fourth place respectively in Wednesday's Swiss event. That one was won by GM Alireza Firouzja, who earned a direct place in the main bracket. On Thursday the Argentinian GM Federico Perez Ponsa got the coveted spot in the main bracket, and three more players qualified for the round robin: GMs Vladimir Fedoseev, Daniel Naroditsky and Salem Saleh. Four more grandmasters were added to the round robin as wild cards: Ian Nepomniachtchi, Jon Ludvig Hammer, Eric Hansen and Bortnyk. The little known grandmaster from Mykolaiv, Ukraine fully justified his selection and won the group with 26.5 points, 1.5 more than Tang. Bortnyk played 2-2 only against runner-up Tang, and defeated all other participants in their four-game mini matches. He smashed both Fedoseev and Meier 4-0 and lost only seven games out of a total 36. The last game between Bortnyk and Tang was a great fight. In the main bracket, Bortnyk will be facing GM Alexander Grischuk, who played in both Swiss qualifiers this week (probably to warm up a little for today) from Shamkir, Azerbaijan where he participates in the Gashimov Memorial. Bortnyk won't be without chances. In both Swiss qualifiers, he actually outperformed Grischuk. A one-on-one match will be different of course, where Grischuk should probably be the favorite although before this match he first needs to play a classical game in Shamkir. The other matchups are Hikaru Nakamura vs Alireza Firouzja (especially here an epic battle is expected), Levon Aronian vs Sergey Karjakin and Maxime Vachier-Lagrave vs Federico Perez Ponsa. Not that not only Grischuk but also Karjakin plays game in Shamkir first, while both Aronian and MVL are playing a Bundesliga game today. Find all info on the Chess.com Bullet Championship here.